Experience the difference that technology can make! 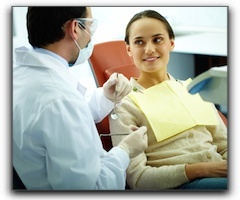 We know that you have many choices for your dental care. We also know how important your smile is. That’s why we are proud to offer comfortable care in a relaxing atmosphere, where we focus solely on ways to maximize the health and beauty of your smile at our San Diego dentist office in La Mesa. We aim to provide dental experiences and results that surpass your expectations. Here, you will find caring professionals who understand the importance of a beautiful, healthy smile. If you have considered making cosmetic enhancements to your smile, it is crucial that you choose a cosmetic dentist who has the experience and knowledge to provide the results you are dreaming of. Our office features the latest in dental technology, which allows us to provide superior care and a more comfortable patient experience. We are able to offer porcelain crowns, fillings, veneers, and we use advanced diagnostic tools like digital X-rays, which produce more detailed images while exposing patients to 90 percent less radiation. We also offer tools like smile analysis, which lets you preview your more beautiful smile. It’s time X-rays went digital, and Dr. Gray utilizes this innovative new technology. Digital X-rays yield larger images than traditional X-rays, and these images can be enhanced, manipulated, easily archived along with your medical records, or e-mailed to your insurance company. They are obtained using small sensors—no more gripping film between your teeth. Digital X-rays make the process easier for patients and more productive for the dentist. Lastly, these images require up to 90% less radiation than with conventional film type x-rays. We are excited to offer this groundbreaking technology to our patients. Dental lasers are extremely focused light beams that are used to alter or remove tissue in small, precise amounts. While laser surgery is not limited to dentistry, many people have never heard of laser dentistry before having it done. Dental lasers are highly versatile and can be used for a variety of procedures involving the inside of the mouth. Some of these procedures include removing overgrown tissue, reshaping the gums, or for teeth whitening. Because of how seamless it is, laser dentistry is a good fir for children who become anxious or afraid when having dental work done. At Jeff Gray DDS – Sedation and Cosmetic Dentistry, we conduct smile makeovers using a combination of porcelain veneers, teeth whitening, porcelain crowns, and more. Smile analysis lets our San Diego area patients see what the results of these procedures will look like before you begin treatment. Contact us today to learn more about our technology or to schedule an appointment if you are in the San Diego area, including La Mesa and El Cajon!